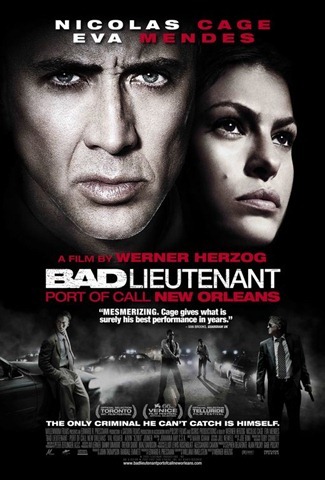 Lieutenant Terence McDonagh is addicted to drugs and gambling, he’s also a detective in post-Katrina New Orleans. The film follows McDonagh as he investigates the murder of five immigrants. First off, I just want to say that this is a very strange and oddly fun film. I am a fan of Cage’s work (less so more recently, but this could be his comeback) and I believe he’s at his best when at his craziest. Think more “Face/Off” than “National Treasure”. Cage certainly brings this zaniness back to form here in a number of ways. The premise alone with a drug-addicted cop who wields his badge as often as he does his gun sets this up perfectly for him, there is nobody else who could have played this role with such appropriate energy. From the plot alone, you can guess how morally inept and wrong this film is…and it is, but its more in a manically humorous way that it is done. This is thanks to director Werner Herzog (Rescue Dawn), whose fearless direction and vision creates a world that is equally realistic, sad, and hellish while keeping you fascinated and thoroughly entertained throughout. The cast is terrific as well. Apart from Cage’s terrific performance, Eva Mendes and Brad Dourif (Deadwood, One Flew Over the Cuckoo’s Nest) bring a lot of heart and conscience to the film – even while portraying a prostitute and a bookie. The role that really stood out for me was the role of Justin, wonderfully and smugly portrayed by Shea Whigham (Pride & Glory, Splinter). While his total on-screen time ran around two minutes, his scenes with Cage were the funniest of the film. Something also has to be said about the cinematography, in which Herzog went a little guerilla-style with. Having the handheld camera follow Cage’s character around made the experience equally fun and disturbing…depending on the scene. Overall, I had some real fun with this movie, despite the subject matter. The direction is spectacular and the cast is in top form here all around. Not for the faint of heart, but I think it’s certainly worth a look after the iguanas are off the coffee table. A very good film. It hits some of the same points, but in a very different manner than the original with Harvey Keitel, which I very highly recommend. It’s brutal and very very hard to watch in some spots; the analogous scenes in this movie are played very differently. But it’s the best Cage I’ve seen in a long time. Any extras on the DVD? Harvey Keitel’s Bad Lieutenant was great, again mostly due to his performance like here with Cage. Not many extras on the DVD worth looking at. There’s a behind the scenes feature which is interesting for a while just to see Herzog at work.